June 21, the second day of the Orthodox Church Council’s work on Crete, saw discussion of the problem of the Orthodox Church diaspora, reports Romfea. The problem of the Church diaspora will be discussed with great difficulty at the Crete Synaxis due to the absence of the delegations of the Russian and Antiochian Orthodox Churches. Representatives of the Serbian Orthodox Church noted during the discussion that in the absence of Local Churches “with great dispersions” it is impossible to make decisions which affect their interests. In his presentation Archbishop Anastasios of Albania, for his part, emphasized: “We should be very careful about what we decide.” As Romfea reports, it was decided at the Council to more thoroughly examine the protocol of the 2009 Chambesy meeting in order to more closely study the problem. 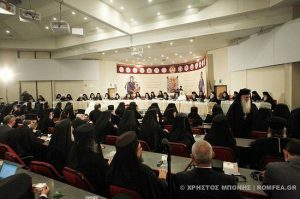 Note that in 2009 at the pre-conciliar meeting in Chambesy it was resolved to create consultative bodies in the form of assemblies of the Orthodox bishops of every jurisdiction bearing responsibility in one or another region. Then it was decided that these organs, under the chairmanship of the local bishop of Constantinople’s jurisdiction, would have an exclusively consultative character. The Orthodox Church diaspora has spread in the context of mass migrations of the twentieth century to territories not within the jurisdiction of any Local Orthodox Church. Bishops and clergy of various jurisdictions have appeared in these countries, giving rise to a specific situation in which more than one Orthodox bishop, belonging to different Local Churches, resides in one and the same city. The truth is: there is NO DIASPORA! A diaspora indicates the Orthodox in N. America, S. America, etc. BELONG elsewhere. Families that emigrated in the 1800’s or 1900’s somehow belong to their ancestral home. This is false. All of the Orthodox in the United States belong to no one but the United States. Where is the American Church represented in this council? This council is bogus and does not represent all the Orthodox worldwide! The word diaspora, used in the Epistles of James and Peter, does not mean–as is commonly, but mistakenly thought–that references to people in any given “diaspora” intend to return to the country of origin, or that they “BELONG elsewhere” (as Phil Philopous writes above). In the New Testament letters, “dispersion” (translating the Greek diaspora) simply referred to the Church (not the Jews) that had “dispersed” throughout the Mediterranean world beginning, obviously, from Jerusalem. At no time did the biblical authors or anyone else in the Church believe that Christians “belonged” to Jerusalem or any other earthly abode; it is quite obvious in the spirit and letter of the New Testament that Christians, wherever they may reside, “belong” to the Kingdom on God. Indeed, arising from “seeds” (Greek: spora), the word diaspora does not inherently imply any sense other than seeds being “planted” elsewhere from their source; seeds obviously do not “belong”or “return” to their source. It should also be noted that at the most recent Council, but also on other occasions, the references by primates of autocephalous Churches to the Church in “diaspora” simply means Orthodox Christians outside the “fixed” (?) geographic boundaries of the autocephalous Churches. There is no conceit that such persons living in the diaspora intend or even desire to “return” to those lands from which their Church undoubtedly “dispersed.” There is also no doubt that the Orthodox Church outside of traditionally Orthodox lands was brought to the cultural West (Western Europe, the Americas) by immigrants and missionaries (in the case of Alaska), having “dispersed” from elsewhere. Likewise, it is obvious that, at least in principle, the most recent Council recognized the need to address and solve the canonical anomaly of the Church in the diaspora. Even in the more common use of the term by the Jewish communities outside Israel, there is not a uniform sense that Jews intend or desire to live in the modern state of Israel, though diaspora is rather uncontroversial in those communities. It does seem odd that only in the USA does the word raise objections among Orthodox, and then only among those who advocate (strenuously) for Orthodox in this nation (or the Americas in general) to be organized as an autocephalous Church. That argument notwithstanding, nobody else in the Orthodox world uses or understand the word diaspora as a pejorative. Of course, those organizations that argue most vociferously for an autocephalous church in the USA uniting all Orthodox usually offer that “ties” with Mother Churches (from whom the Orthodox in this country trace their ecclesiastical roots!) will be strengthened and not cut by the canonical and administrative unity of the Church here. Yet in rejecting the one word that adequately describes how the Church came to America (it did not spontaneously appear! ), and rejecting the one word by which ALL autocephalous Churches refer to Orthodox outside the geographic boundaries of those Churches, it sounds to THEM as if there is a rejection of the historical, canonical, and spiritual connections to those Churches. That just sounds so self-defeating. At seminary, a Mekite (Byzantine Rite Church in communion with Rome) student once objected to a professor or mine that the word “uniate” was offensive. The Professor replied, “The Pope of Rome calls you uniates. The Orthodox calls you uniates. Your bishops call you uniates. The word means ‘those united to’, and you say you are united to Rome. So I do not call you uniates to offend you; I call you uniates because you are uniates.” The same could be said of diaspora which, after all, Saint James (Iakovos) and Saint Peter used to refer to their sisters and brothers living outside of Jerusalem (and the Roman province of Judea generally). I don’t live in Jerusalem, so the word (and the words of the epistles they wrote) applies to me. Embrace it: it means we are seeds intended to grow roots and grow (we commonly speak, in English anyway, of “planting” churches and missions). That is a good thing.